We continue to look at several key goals of education through a biblical worldview lens. I want to remind you that these goals must be pursued in the home, church and school so that God’s ultimate purpose for education (to prepare students to live a life that glorifies God) can be realized. Last week we looked at how education should lead people to true worship of God. The second goal of education can be stated this way. Education must lead to transformed lives. Most of us are familiar with Paul’s challenge in Romans 12. Paul warns believers not to be conformed to this world. Instead, Christians are to live transformed lives. 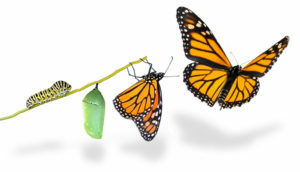 Transformation is not a minor change in one’s lifestyle. It can be compared to the changing of a caterpillar into a beautiful butterfly. In his 1828 dictionary, Webster defines transformation as a change of heart in man, by which his disposition and temper are conformed to the divine image; a change from enmity to holiness and love. A person can only know and discern God’s will for him/her if his/her mind is not conformed to worldly or secular thinking. From the Scripture stated above, one sees that this type of change only happens when there is a complete renewing of the mind. This verse also tells us why God wants every Christian to be transformed through the renewing of the mind. It is so that every believer can know God’s will for his/her life. A person can only know and discern God’s will for him/her if his/her mind is not conformed to worldly or secular thinking. However, all people are born with a sin nature which also means that our minds are naturally filled with carnal thoughts that are in line with the world’s way of thinking and acting. Our natural minds must be thoroughly made new so that we will think and act from a biblical worldview perspective. This must be one of the main goals of the education we give our children and youth in the home, church and school. John A. Hughes puts it this way. God-honoring education will assist the Christian in this mental renewing process by providing a foundation of worldview assumptions and by cultivating logical thinking processes, habits or analysis, and patterns of evaluation that are distinctively biblical. The reality is that all education has as one of its main goals the shaping of a person’s worldview. There is no such thing as a neutral education. Secular education is based on a man-centered worldview where God is either ignored or blatantly denied. Man is the ultimate authority and every individual determines what he/she should become. Secular education’s aim is to make all students function well in a completely secular society. This is exactly what King Nebuchadnezzar wanted to accomplish in the lives of a select group of Hebrew young people. Ravi Zacharias makes a bold statement about the goal of every educational effort in his book, Deliver Us From Evil. And for centuries politics has dabbled in the deadly game of social engineering. The whole point of state-controlled education is that it gives to the government the power to shape the souls and write on the fresh slates of young hearts. This empowerment is the most important trust given to elected officers, and to assume that they accept that responsibility from a posture of neutrality is to live under the most destructive illusion. To elect one to the highest level of leadership, therefore, is to put into his or her hands the possibility and opportunity of shaping a nation’s conscience. The whole point of state-controlled education is that it gives to the government the power to shape the souls and write on the fresh slates of young hearts. This is frightening to say the least when one considers that the majority of Christians have given the government control of their children’s education. We can see the devastating effects of this in everyday life across the nation and around the world. It is important that parents, church leaders and educators strive to provide future generations an education that will instill a biblical worldview in their hearts and minds. This can only take place when the education our children and youth receive at home, church and school strives to achieve the goal of biblically transforming their lives. Every subject and every activity must involve the renewing of the mind in line with Romans 12:2. The question we must ask ourselves is, how does one’s mind be renewed? We can discover the process of renewing the mind in one of Paul’s letters to the church in Corinth. Parents, church leaders and educators must understand that we are engaged in a spiritual battle for the hearts and minds of our children and youth. The major front for this battle is being fought on educational turf. No one involved in the education of others does so from a neutral position. One’s worldview will always be transmitted to the child in some way or another. We must ask ourselves some questions. Is the education that your children are receiving at home, church and school based on a biblical worldview? What are you doing to make sure that your children’s education is focused on the spiritual formation (transformation) of their lives? What are you doing to make sure children and youth are having their minds renewed so that they can discern God’s will for their lives? Thank you for the wisdom in this. We are heading to the Missouri stage Capitol this Thursday to voice school choice. Our students are singing in the rotunda and our small school group of 27 kids will be visiting with our representatives and senators, encouraging them to vote yes to school choice bills. Will you please pray for us that we can express this in a passionate way. Missouri has no school choice laws. The language we hear in rural Missouri is this: “we have such great Christian teachers in our public school, our kids need these teachers and the schools aren’t fully funded.” I say, oh well.,,it’s not the teachers job to educate our most God given precious gift and the public school are secular in every way even if there are Christian teachers.